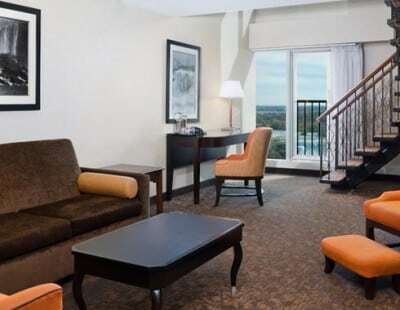 The Sheraton on the Falls boasts 669 first class hotel accommodations, varying from traditional guestrooms to beautiful Fallsview suites featuring our unique floor-to ceiling windows providing you with the best hotel view of Niagara Falls guaranteed. 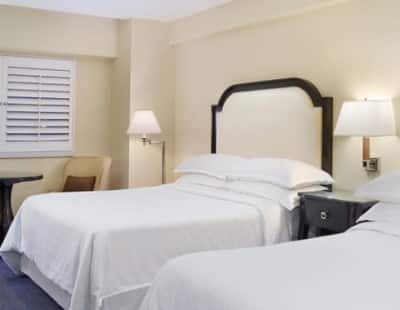 For your comfort, all guestrooms and public areas are 100% SMOKE FREE. Situated between the second and eighth floors, Garden View Rooms feature serene views of Oakes Garden from a Juliette balcony. Light, neutral tones and floor-to-ceiling windows highlight the stunning panorama, while contemporary furnishings and artwork reveal a modern take on a classical design. Enjoy the soothing scene from the sitting area, which features a cozy fireplace. Or connect to the world at the work desk via High Speed Internet Access. A refrigerator and coffee and tea maker, stocked with complimentary Starbucks coffee and Tazo tea, keep your favourite (non alcoholic) beverages on hand. Learn More. Discover comfort and convenience in City View Rooms, where views of downtown Niagara and thoughtful amenities guarantee an effortless stay. Along with High Speed Internet Access, guests enjoy a 37-inch LED TV. A Sheraton Signature Bed and marble bathroom with Le Grand Bain bath amenities further elevate downtime. (284-340 Square Feet / 26-32 Square Meters) Learn More. Enjoy a memorable stay in spacious Fallsview Rooms, which offer either a full or partial view of the falls from a Juliette balcony. A fireplace adds to the exceptional setting, while select rooms offer a comfortable sleeper sofa. High Speed Internet Access and a 37-inch LED TV keep you in touch with the world, while signature amenities—like a Sheraton Signature Bed—provide rare relaxation. (258-425 Square Feet / 24-39 Square Meters) Learn More. Enjoy a memorable stay in spacious Falls View Rooms, which offer either a full or partial view of the falls from a Juliette balcony. A fireplace adds to the exceptional setting, while select rooms offer a comfortable sleeper sofa. High Speed Internet Access and a 37-inch LED TV keep you in touch with the world, while signature amenities—like a Sheraton Signature Bed—provide rare relaxation. (258-425 Square Feet / 24-39 Square Meters) Learn More. Take full advantage of the hotel’s unrivaled location in our Bi-Level Suites. Perched on the top floor, they provide unparalleled panoramas of Niagara Falls from floor-to-ceiling windows. A living room with a Juliette balcony, fireplace, and sleeper sofa invites you to relax and enjoy the vista. Meanwhile, a spiral staircase leads to the master bedroom and bathroom, which features a whirlpool tub and shower. A guest bathroom adds convenience. (780-1,173 Square Feet / 72-109 Square Meters) Learn More. Located on preferred floors, Sheraton Club Rooms offer captivating American Falls views from a Juliette balcony along with upgraded amenities, free bottled water, and complimentary fitness center access. A Sheraton Signature Bed and Le Grand Bain bath amenities add to the residential comfort. (405-425 Square Feet / 38-39 Square Meters) Learn More. The Sheraton on the Falls features a number of different rooms and suites that offer a jetted whirlpool tub in the bathroom. These jacuzzi-like bath tubs offer a great way to relax and unwind after a busy day of sightseeing and attractions. Learn More. Discover the comfort and convenience of our Interior View Rooms, which are conveniently located between the third and seventh floors of the hotel. Along with High Speed Internet Access, guests enjoy a 37-inch LED TV, a Sheraton Signature Bed and marble bathroom with Le Grand Bain bath amenities. (284-340 Square Feet / 26-32 Square Meters) Learn More. After a great day in the Falls settle in for a relaxing and comfortable rest in a Sheraton Signature Bed. 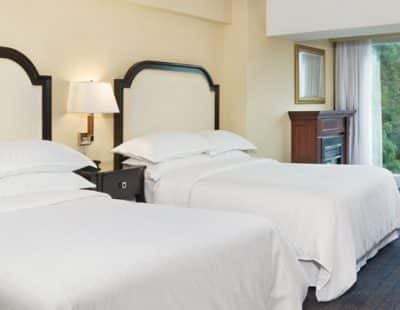 From rooms with a beautiful view of the city of Niagara Falls to our spacious Fallsview rooms, the Sheraton offers a wide selection of rooms to satisfy every lodging need.